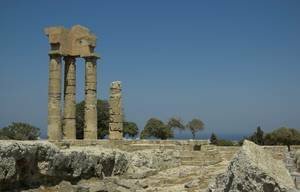 Internship tourism on Rhodes - Internship opportunities in Greece! Rhodes offers long beaches, over 300 days of sunshine per year and its spectacular nature round the picture of this beautiful island in the southern Aegean Sea. 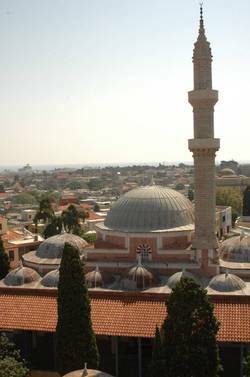 It is the largest of the Dodecanese Islands and the most south-easterly of all the Greek Islands of the coast of Turkey. Unfortunately, the Colossus of Rhodes was destroyed by an earthquake, but in ancient times this monumental bronze statue of the sun God Helios was one of the seven wonders of the world. The statue was 34 meters high, which was set up after twelve years of construction in the island capital, Rhodes and that was about 292 before Christ. Today there is nothing left of the statue but the tourists still like to buy the reproduced figures as souvenirs. The old town of Rhodes is split into 2 parts. The northern part of the town is called “Castello”, where you can see the Grand Masters Palace. This is an old palace, and not like most you see today. There are few furnishings inside and most of the floors are tiled in mosaics. The entrance of the palace is still original with its impressive towers. After looking around the palace itself, there is a museum to look around as well. This is a historic part of the city and has been preserved to keep its authentic feel which is seen as the old part of the city. 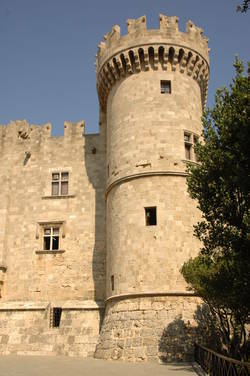 The old city Kameiros is the most important archaeological site of Rhodes. There are several buses that take you up to these ruins; however they can be very sporadic throughout the day. The ruins themselves are approximately 3000 years old. It is a relatively small site of ruins, and most people spend an hour or two here. As it is situated on a hillside there are fabulous views from the ruins that look over the sea and on a clear day across to Turkey. This is a fabulous quaint village. It is full of small twisty narrow streets. Here are many cafés and restaurants and all offer a high quality of food. There are many people who offer donkey rides to the Acropolis, although it is accessible by foot too. A trip to the water park makes for a great day out. There are great amenities, and rides and slides for all ages. We suggest you take a picnic or some snacks with you as the food is not fantastic and is quite expensive. There is a free bus ride from Pefkos to Faliraki, but most tourists organize a coach ride with their hotel. Ask your colleagues in the Reception Department or in the excursions/tourist information centre and they will be able to help you with more details. You can take the ferry to Symi, or take a boat trip that stops at a monastery. As you get off the ferry/boat there are a few quaint shops in the harbor. Here is also a small train that you can take for about 6 € each; this takes you on a tour to the top of a hill. A quiet sandy beach, situated north of Lindos. Here are plenty of options for eating in restaurants and drinking in cafés along the promenade. Here is also a company which provides water sports too. This beach can get quite busy in the summer season as it is the only sandy beach in the Haraki area. Here are a few beach bars to get cold drinks from. The water is quite shallow making it perfect for swimming. This is a stony sandy beach, beach shoes are advised. There are giant rock pools here and the water is crystal clear, this makes it a great place to snorkel! There is a small lagoon with steps into it, this is where most people swim, and the water is slightly warmer. A sandy beach, again with shallow waters for a long way out in the sea. As with many of the beaches on Greece there are bars on the beach for you to easily get the ice cold refreshment you´ll need in the summer sun. Here are great inlets in the rocks, and so it makes a great place for snorkeling – take your own equipment with you! On the island are many car hiring companies available, especially near the airport or in the larger towns like Rhodes Town. It is very important that you meet the requirements to borrow a car like your age, insurance and license. Online you will find the car rental services which are close to you. 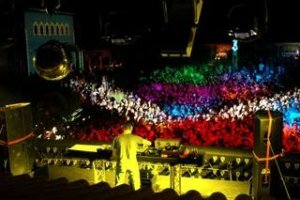 Rhodes is home to a few nightclubs as well as many restaurants and bars. 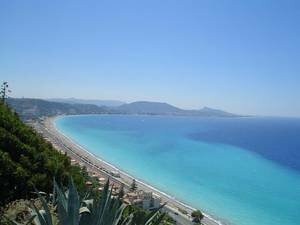 In each town mainly the coastal towns here are many bars at the line of the promenade. There is a wine bar in Rhodes’ old town called: Paffuto Wine Music Bar which we recommend you to visit during your internship tourism on Rhodes. Rhodes is not the place you are looking for?